Winmate Cedar Trail Panel PC (Dual Core Atom , 2.13Ghz) from 7"~ 42"
Winmate is proud to announce Intel® Atom Series embedded platforms for fanless solution powered by Intel® Atom D2700 Dual Core processor running at 2.13GHz, from the Cedar Trail family. Based on the lower TDP and higher clock frequency (2.13GHz), Winmate has developed a new series of embedded platforms which includes: Single Board Computers, Industrial Motherboards, Fanless Panel PC, G-win Panel PC, Embedded Fanless Box PCs, and OPS Pluggable Module. All Intel Atom D2700 and N2600 (by request) series are available now. Please contact Winmate’s local sales or visit the website for more details. 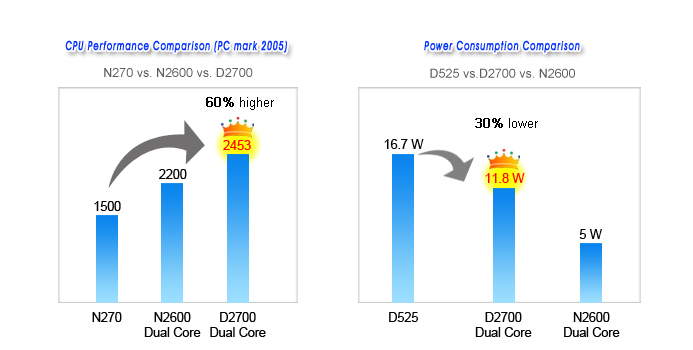 As this CPU family has higher TDP and power consumption, Winmate has designed-in a special adjusted heat sink system to ensure stable and reliable operation without the use of any fan. Please see the specific operating temperature range for each product in its Datasheet. It can range from -20 up to +55, depending on the model and housing type.